Social media is changing the way automakers communicate new products and information to fans and enthusiasts. Ford has been utilizing social media for quite some now, and earlier today they have released a new video of their 2012 Ford Focus ST testing in rainy conditions on Facebook. "Our Facebook page allows us to reach out to enthusiasts around the world for the first time and share with them the final stages of development of the new Focus ST as it happens," said driver/narrator and Ford&apos;s Director of Global Performance Vehicles and Motorsport Business Development Jost Capito. He continued: "This is Ford&apos;s first truly global performance vehicle, and social media gives us a rare opportunity to show enthusiasts how this car is progressing, gives insight into its technologies and builds excitement in this community as we finalize Focus ST&apos;s technical specifications." Stationed at the Lommel test facility just outside the hamlet of Kattenbos, Belgium, the track has a location perfect for access to the American automaker&apos;s main development centers and production plants in the UK and Germany. The center features tracks and roads from all over the world to simulate realistic driving conditions. The video shows Ford&apos;s latest hot hatch hitting the track in the rain, as the Focus ST needs to be able to perform well in all conditions in all countries. It is a big part Ford&apos;s global lineup. 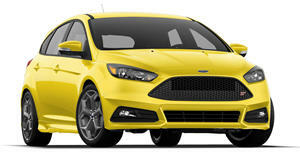 The 2012 Focus ST is scheduled to launch next year and is entering its final stages of development now.